Last year, it was the A3 Saloon that Audi commemoratively Clubsport-ed for the hoards of VAG devotees at its annual Wörthersee meet. This year, it’s the TT. This, Internet, is the 592bhp TT Clubsport Turbo. Yep, 592. 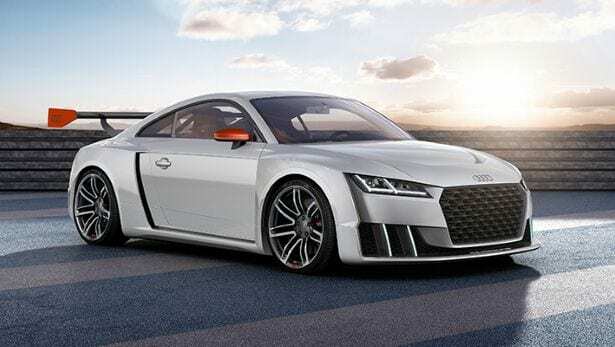 Inspired, says Audi, by the 90 IMSA GTO of the late 80s, the TT Clubsport has the same 2.5-litre five as last year’s A3 Clubsport, which at heart is the same engine you’ll find in the road-going RS3 and RS Q3. And naturally, there’s a whacking-great turbocharger – this time an ‘electronic biturbo’ – which Audi says “boosts sprinting ability and torque and enables high peak power”. And, chiefly, minimises lag. The body’s 14cm wider than before, and it’s been treated to a manually-adjustable rear-wing (from the TT Cup car), a titanium roll-cage, lightweight buckets with four-point harnesses and a set of 370mm carbon-ceramics, which sit behind 20in alloys shod with vast 275-section rubber.